Touring awnings are suitable for pitching at any time of the year. Sentinel Luxe 600 Fabric – Highly waterproof and able to withstand harsh weather conditions. 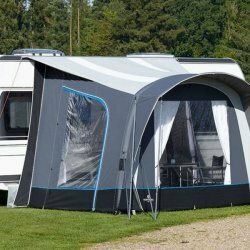 The super strong 600 denier double ripstop threads make it one of the strongest awning fabrics. Bracer beams included – Designed to fit in between the awnings main AirBeams® to enhance stability. 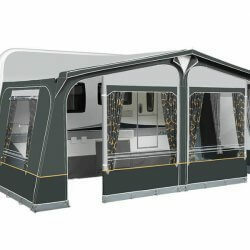 Vango’s Kalari II is the market leading caravan awning, iconic, luxurious and innovative can describe this awning. 2018 features new smooth curve beams and vista front windows. The Vango Sentinel Luxe 600 fabric provides sensational quality. Kalari II has adopted the new Grey Violet colour to brighten the interior and has flexi doors which multiple options.